Purple Martin Monitoring /Hawks Aloft Inc. 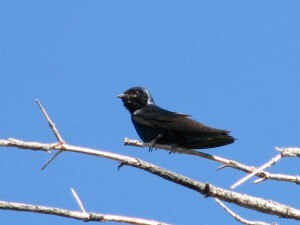 The Purple Martin, one of United States’ largest and most widespread swallows, is an interesting species with significant differences between those present in the Eastern portion of the United States and those in the West. In the East, these year-round insectivores primarily nest in man-made nest boxes and as such, they have become increasingly urban. 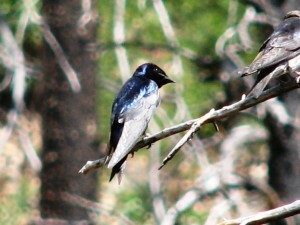 Yet, in New Mexico and the other Western states, Purple Martins still favor natural cavities and old woodpecker holes. In the aftermath of an extensive forest fire in the Lincoln National Forest, Hawks Aloft began surveys to locate and monitor Purple Martin colonies in the area. The mission of this study was three-fold: to identify colony sites, to determine specifications of snags used for perching and nesting, and to establish an easily repeated protocol for gauging trends in their populations in the Lincoln National Forest. Having assessed the number of colonies and approximate populations, researchers determined important clusters of snags favored by the martins enabling the US Forest Service to plan for future post-fire management of the area and protect current nesting sites. Particularly in the West, where the Purple Martin’s habitat is more fragile than in the East, it is important to consistently monitor their populations in order to ensure continued success.